Harbour Ville Hotel in Singapore welcomes you with warm and friendly service. Experience Singapore at its warmest and most friendly at the Harbour Ville Hotel. 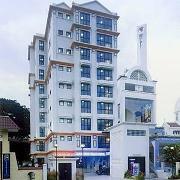 A charming boutique hotel in Singapore renowned for its excellent location and emphasis on service. This Singapore hotel is only minutes from many exciting tourist attractions and the Central Business District. Buses are available right in front of the hotel. Local trains from the nearest Outram MRT (subway/train) Station will take you to other places in the city.